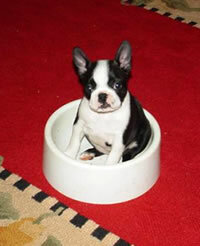 The Boston Terrier Club of America is dedicated to educating the public, breeders, judges and pet owners alike about this wonderful breed, the Boston Terrier. The big little dog, affectionately known as the American Gentleman, has come a long way in the last 100 years, in fact, in just 25 years, particularly when it comes to education of this tuxedo coated dapper little dog. Our club offers a wealth of information for those who currently own a Boston Terrier, or for someone wanting a Boston Terrier as a pet or a show prospect. As you journey through this website filled with educational material, you will find resources and data which may prompt you with questions. Please feel free to contact any board member or a committee chair pertaining to a particular subject, and we will certainly do our very best to supply you with answers or resources. Please check out the History of the Breed and the Breed Standard. For statistics on all other information regarding competitive events for this versatile breed, please click on Events. Health is one of the most important topics in all breeds. We offer education on Health matters for all Boston Terrier owners and our health committee is aware of any of new developments in the field of canine veterinary medicine and canine genetics affecting our breed. We have a great Judges’ Education program and we continue to receive requests for breed presentations from several judges’ organizations throughout the country. In addition, through our Continuing Education program, we are always looking for ideas to share with breeders /pet owners alike. Thanks for visiting our website, we hope you found it extremely helpful and informative.